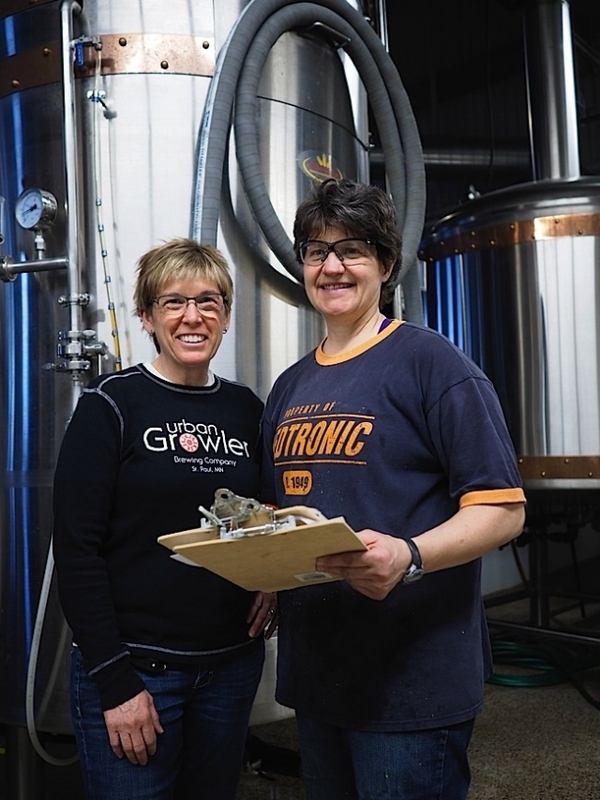 Urban Growler Brewery’s creator-owner-operators, Deb Loch and Jill Pavlak, talked with Lavender about their seven-year path to becoming Minnesota’s first woman-owned and -brewed packaging microbrewery. Deb Loch: Well, we didn’t have a “barn” for a long time; what we had was an idea. And this idea started six years before we opened. It wasn’t something we thought of overnight. We both had careers, with what most people would probably say were pretty good jobs, and we both quit our jobs to pursue our passion in brewery. DL: A very livable wage. JP: …to eight and ten-dollar-an-hour jobs just to get experience, it was quite an adjustment. DL: Even going to brewing school. JP: We moved to California so Deb could get her master’s in brewing at UC Davis. DL: We have complementary sets of skills. Jill is a sales person, people person, networker, connector. 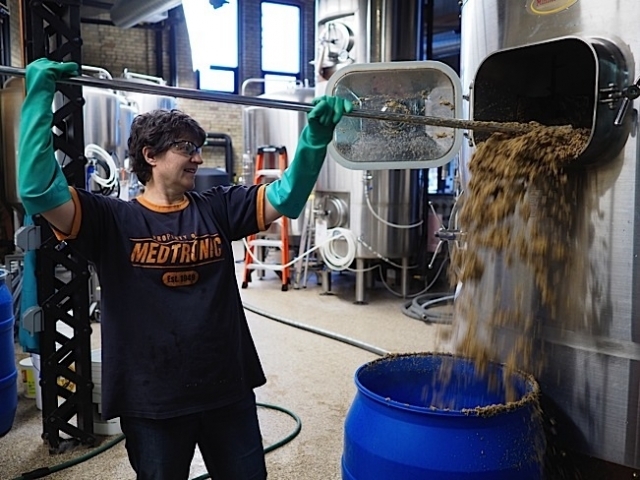 I’m a biomedical engineer by training, and, you know, if I’d known that was perfect training for being a brewer, I would have done it a lot sooner. Owners Jill Pavlek and Deb Loch confer. Photo by Ethan Boatner. When did you finally open the doors? DL: July 30, 2014, was our first official day. Were you both beer drinkers? DL: I like the social part, too, but I also love the taste of it, the science of it, the art of it. Obviously there’s a beer spectrum a taproom is expected to have — light, dark, and so on; how did you decide what to brew? DL: It came about through home brewing; lots of home brewing. I’m a home brewer, so I literally have hundreds of recipes. Some were terrible — the one I made out of our Christmas tree; the beet beer — they went down the drain. What are some of your other unusual brews? I liked your bourbon-recipe-modified ale. DL: City Day Ale. That’s always on tap. The Candy Corn Imperial Cream Ale for Halloween — we actually pulverized candy corn — was well received. We Make an Imperial Smoked Chipotle Porter. But the Rhubarb Wit is probably one of the most popular. We couldn’t make enough of that, but we can only make it while there’s rhubarb, from late spring to mid-summerish. We’ve got some interesting stuff coming, one probably for Cinco de Mayo, and then the Rhubarb Wit after that. JP: That won an award with the Rails and Ales last summer. They did a Light Rail, Green Line pub-crawl, and gave one award for the best beer and the Rhubarb Wit won. DL: And we have our Plow to Pint series beer where we partner with local farmers to bring their ingredients into our beer. How many beers did you have when you opened? JP: Two. Cowbell Cream Ale and a Session IPA. Today we vary between six and ten. Does your grain come from Minnesota? DL: A lot of our grain does come from a maltster right here: Rahr Malting in Shakopee. Depending on the beer styles, we’ll get the appropriate grains from the UK, from Patagonia, Canada, Germany; it just depends on what I’m making. Would you give a brief rundown of the process? DL: The grain starts in the Mill Room. They crush the grain and we augur it up to the Mash Tun, and after the Mash Tun, it gets pumped up into the Lauder Tun, the last place the grain goes. We’re extracting all the sugar out of the grain to make the wort. And that’s what the yeast ferments; the wort. Sugar-water, basically. Deb Loch clears out the Lauder Tun. Photo by Ethan Boatner. Where does that go? I watched Deb shoveling grain out of the Lauder Tun. JP: We met a couple at the St. Paul Farmer’s Market that has a farm in Wisconsin. They come in every Saturday and pick up three to six blue barrels of grain. They say their livestock loves it. We intend to buy meat from them once we expand the kitchen. JP: The menu will still be small, we plan to add burgers and Wisconsin-style fish fries. It’s not a five-star restaurant, we want food that goes great with beer, that complement each other. Hopefully by the time Pride comes around, we’ll be under way, or done, but at this point we’re still waiting to hear from the Department of Agriculture. How did you even get funding to start? DL: In those six years before we opened, we worked a long time on the business plan. It’s a little excessive: a hundred and ninety-some pages long. JP: Deb is the numbers person. I’m a sales person; I just wanted us to rent a little garage space, throw open the door and start selling growlers, but Deb said, “We can’t sustain that, we’re not going to make a living doing that.” And so that business plan is thorough. Very thorough. That’s why it was so frustrating with banks; we’d give them this very well-thought-out plan, and they didn’t give us the time of day. Where did you finally go? DL: A farmer’s bank, basically. JP: Pioneer Bank in Mankato and they were fantastic. It was how I envisioned banks and clients used to do business in the past. JP: We rented this space a little over a year before we opened. We needed to raise a large sum of money, so we gave tours of this empty shell and gave away food, gave tours, and drawings (we had drawings of what we hoped the space would look like one day). We’d say, “Imagine these beautiful stainless tanks over against the wall, and the beer garden. We sold t-shirts to help pay the rent. Hundreds of people came through, and we raised the money we needed to secure the SBA (Small Business Association) loan. Some of those people get a beer a day for life, some might get two beers a day for life. DL: In a sense. It’s kind of like a car. You get a base model and you can tweak it how you want. Different heights, different diameters, there’s different things you can get on them, different manufacturers. There’s an infinite number of possibilities. And you also got married? Did being gay have any impact on the business end of things? JP: Well, this started during a very divisive presidential campaign, so that’s very gay-related. It was when the Catholic Church sent out a ton of CDs to protest marriage for the GLBT community, and we were like, “What the hell?” We were both raised Catholic, and we thought, “If people would just sit down and have a beer with us they would realize that there is nothing to be afraid of.” We decided we wanted to have a place where people could come together, and have a beer and find out what they have in common. We were sick of the divisiveness. So, all are welcome here. It’s not a gay brewery, it’s not a non-gay brewery; it really is a non-issue here. And transgender people — it doesn’t matter. DL: And we had said we were paying attention to women, but not at the exclusion of men. I think some of the community thought we meant that we were going to be a women’s bar. No. We do things to try to bring all people together. JP: One of the things we did was put a vestibule around our front door. It doesn’t sound like a big deal, but often women get cold, guys sometimes have a different thermostat. It may be welcoming people that we don’t agree with as well. We’re not just for one party or the other, we’ve had Al Franken and we’ve had young Republicans. We have some seminarians that play bluegrass music one Sunday a month; that doesn’t mean we wouldn’t have some other church or belief come in playing some music. DL: We have giant picnic tables out in the beer garden and people share them. JP: We encourage community tables. When that does happen, often on the patio, people make new friends. DL: If people want to have a private party, they can have it upstairs, but the taproom is common space. See your face here! Photo by Ethan Boatner. What is the beer experience you want to present to the public? DL: Well-balanced. As the brewer, my style in general is very drinkable, approachable, interesting. So: fun, interesting, drinkable, with moderate alcohol. 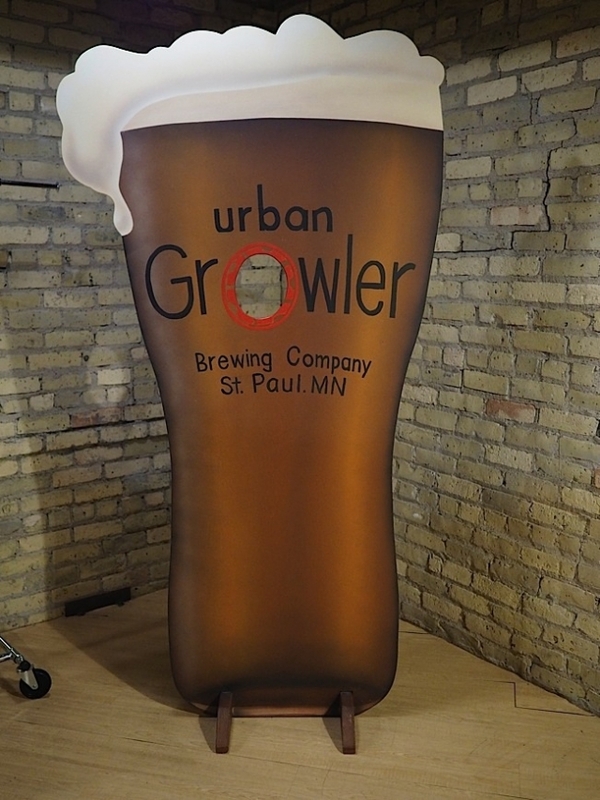 What makes Urban Growler stand out? JP: We keep hearing how warm we are. The staff are wonderful. The space alone is very warm and inviting. We get people in here who aren’t even beer drinkers. They might be wine drinkers and they’re here with friends or family. So we do a variety of flavors and we have tasting platters so you can get small tastes of a bunch of different flavors. Our goal is to find at least one beer that you like. We want people to feel warm and welcome. DL: I want to mention that we’re more than just a taproom; we’re a packaging microbrewery. JP: That’s a distinction I wanted to make, too. We’re not a brewpub; a brewpub can’t distribute, but they can carry other people’s beer and wine and alcohol. We can only sell our beer. We’re a packaging microbrewery with a taproom and a kitchen. What that means is that we distribute our beer. So when we’re talking about being warm and welcoming, we’re talking about more than just the taproom, we’re talking about our brand. What’s it like to have the mega Surly Brewery right down the road? DL: Great! Actually, it brings people together. We’re very happy that they are as close as they are and that they didn’t locate somewhere else in the suburbs. And we have another brewery, Bang, right across the parking lot. Is Urban Growler a prime destination for beer connoisseurs? Or do you aim to welcome everyone? JP: We attract beer connoisseurs and we attract a lot of people who wouldn’t necessarily call themselves craft beer aficionados. It’s partly the neighborhood, it’s also media, the coverage. We’ve gotten good coverage, I think at first because we were women, now more because of our beer. What would you like to say to Lavender readers?